An interesting exercise for Bible readers is to take the geographical predictions of the Hebrew prophets and transpose the ancient place names with modern place names, for example, Amman, would be Jordan, so would Moab and Edom, Elam would be Iran, Persia also is Iran, Assyria would be part of Iran and part of Iraq, Babylon proper is Iraq. In this end-times scenario, God directly addresses “Tyre and Sidon”, in a menacing fashion, challenging them to take vengeance upon Him if they can. Tyre and Sidon and the “coasts of Philistia ” as the passage relates is the area we know of as Southern Lebanon and Gaza. Lebanon has been known as the only Christian country in the Middle East. Christianity in Lebanon goes back to Jesus himself, who healed the daughter of a Syro-Phoenician woman in Matthews gospel, chapter 15. For centuries, Christian sects such as the Maronites, Melkites, Greek Orthodox and Roman Catholics, Syrian Orthodox, and Protestants constituted the majority in the land of the ancient Phoenicians. But in our own lifetime things have changed dramatically. Decades before 9-11 woke America to the reality of the international war against humanity that Islam is waging, Lebanon suffered a campaign of “ethnic cleansing” of Christians by Muslims. Christian villages were assaulted and centuries old christian communities were broken up and or destroyed by well armed and supported Muslim militias, driving many Christians out of the country. Mercenaries from across the Muslim world have been involved in this Jihad of pillage and murder. From Southern Lebanon, through the 1970′s and early 1980′s, the PLO Terrorist group would often launch border raids upon Israel, terrorizing and killing many innocent Israeli’s and others. The provocations increased until they became intolerable and the U.N. proved impotent to stem the slaughter along Israel’s northern border. In June 1982 Israel launched “Operation Peace For Galilee”, an invasion of Lebanon that stopped just short of Beirut. There the U.N. stepped in and literally saved Yasser Arafat and the remnant of his shattered army, shipping them off to Tunisia, to live and terrorize for many other days. Israel occupied southern Lebanon, making the area a sanctuary for Christian refugees from the Jihad in Lebanon. But in May of 2000, Israel voted to withdraw from Lebanon, wearying of the steady casualty count, primarily due to the terrorist activity of the Iranian/Syrian backed group Hezbollah. As Israel withdrew, Hezbollah became brazen in advancing, thus giving the Arab world the delusion that they had driven Israel out of Southern Lebanon! Thus Hezbollah, and in particular its spokesman Sayyad Nasrallah, have become “rock Stars” throughout the Muslim world, for being the first to impose defeat on the modern state of Israel. Could the Holy God be addressing Hezbollah, when He singles out “Tyre and Sidon”, ie Southern Lebanon, in Joel 3? Will you avenge yourself upon me Tyre and Sidon? See how I will avenge myself on you! 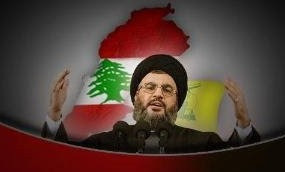 Nasrallah and the terrorist group Hezbollah, which have insinuated themselves into the vacuum of Southern Lebanon by the withdrawal of Israel, have been boasting of their upcoming total victory over Israel and Israel’s God. We will see soon enough how that turns out.